Over the past two months, one of the most contentious issues in the Orthodox ecclesiastical world, the “Ukrainian issue”, has surfaced and evolved rapidly. The term describes Ukraine’s attempt to establish an “autocephalous” church. In other words, to establish a church that would not be ecclesiastically subordinated to any other ecclesiastical authority of a foreign state, but instead would be an independent and self-governed national church managing its own affairs. Briefly described, the issue is that the Ecumenical Patriarchate of Constantinople has decided on October 11, 2018, to grant the “autocephaly” to the Church of Ukraine, to canonically reinstate two leaders of Ukrainian churches (Filaret Denyshenko and Makariy Maletych) to their hierarchical or priestly rank and restore their communion with the church, to cancel the 1686 Synodal Letter, and to appeal to all sides involved to avoid the appropriation of Churches, Monasteries and other properties, as well as every other act of violence and retaliation, so that the peace and love of Christ may prevail. More recently, the Ecumenical Patriarch Bartholomew signed a bilateral co-ordination and co-operation agreement with the Ukrainian President Poroshenko on November 3, 2018, which, according to Patriarch Bartholomew, is the last and necessary step before the publication of the final “Tomos of Autocephaly” for the Orthodox Church of Ukraine. This decision met the strong opposition of the Moscow Patriarchate, which, on October 15, 2018, decided to break the “Eucharistic communion” with the Ecumenical Patriarchate of Constantinople, expressed its full support to Metropolitan Onufry of Kiev and his Ukrainian Orthodox Church, and called upon the Primates and Holy Synods of the other Orthodox Churches to a proper evaluation of the “anti-canonical actions”. Next, we present the Orthodox ecclesiastic situation in the Ukraine, the ecclesiastical arguments of the Ecumenical Patriarchate and of the Moscow Patriarchate, and the political context within which the crisis erupted and developed. The first is “The Ukrainian Orthodox Church – Moscow Patriarchate” (UOC-MP), in close spiritual connection with the Moscow Patriarchate and headed by Metropolitan Onufry Berezovsky. The UOC-MP was founded in 1990 as a self-governing Church, but spiritually belongs to the ecclesiastical jurisdiction of the Russian Orthodox Church (ROC). It is considered to have the largest number of believers in the Ukraine today, as it consists of more than 11,000 parishes, accounting for about 55% of the country’s religious population. Next is the “Ukrainian Orthodox Church – Kiev Patriarchate” (UOC-KP), which is the second most important church in the Ukraine and has been headed by Filaret Denyshenko since 1995. Its power is estimated at about 5,000 parishes. Filaret first served with the ROC as a metropolitan of Kiev, but in 1992 he was forced to resign from the ecclesiastical throne, as he was accused by the ROC of being incompetent, authoritarian and a KGB agent. [ii] Shortly after, however, he recalled his resignation, pioneered the establishment of the “Ukrainian Orthodox Church” (June 6, 1992), and, 3 years later (July 1995), became its leader. The Moscow Patriarchate reacted strongly on June 11, 1992 by excommunicating and declaring him a schismatic, while it has regarded all his actions as anti-canonical. Furthermore, the Moscow Patriarchate denounced Filaret’s actions to the other Orthodox Churches and asked them not to recognize his Church. In fact, until recently, the vast majority of the other Orthodox Churches, including the Ecumenical Patriarchate, had considered Ukraine as a canonical entity of the Moscow Patriarchate and had not recognized canonically Philaret’ s Church. The third is “The Ukrainian Autocephalous Orthodox Church” (UAOC), headed by Metropolitan Makariy Maletych. This church considers itself the successor of the Ukrainian Church that had been established in the country in 1921 and was re-established in 1991. The Moscow Patriarchate considers also this church to be schismatic. The number of parishes following Makariy is estimated at about 500 or, according to others, at about a 1000. Recently, Filaret, supported by President Poroshenko,[iii] has asked the Ecumenical Patriarchate to deal with the ecclesiastical situation in the Ukraine. He asked for the removal of his “anathema” and “ex-communion”, and the recognition of his church as “autocephalous” and independent. Thus, the Ecumenical Patriarchate, considering that canonically has every right and obligation to do so, responded positively to the Ukrainian requests. As a first step, it sent to the Ukraine two Patriarchal Exarchs, Archbishop Daniel of Pamphilon and Bishop Hilarion of Edmonton, in order to examine the situation and report back to Constantinople. To this initiative the Moscow Patriarchate reacted and accused the Ecumenical Patriarchate for flagrant violation of the ecclesiastical law and ‘encroachment’ in the territory of the sole canonical church in Ukraine; that is, the UOC-MP. The Moscow Patriarchate claimed that for more than three centuries the Ukrainian Church was under its jurisdiction, as the Ecumenical Patriarchate itself with an “Act” in 1686[iv] passed to Moscow the jurisdiction over the Metropolis of Kiev, which was then the Ukrainian Church. Ever since, according to Moscow, this change has never been questioned and challenging such ancient ecclesiastical documents is not in agreement with the practice and ethos of the Orthodox Church. Moreover, Moscow reminded to the Ecumenical Patriarchate that at the time when the ROC condemned Filaret for being schismatic, the Ecumenical Patriarchate had considered this an issue within the internal affairs of the Moscow Patriarchate and had agreed to the imposed sentence of the ex-communion on Filaret. Consequently, according to Moscow, the Ecumenical Patriarchate had no right to intervene in the Ukrainian ecclesiastical affairs. The Ecumenical Patriarchate, from its perspective, considers that it had (and still does have) every ecclesiastical right to intervene, as it is the “Mother Church” of most modern Orthodox Churches. It reminded that it has given the Christian faith not only to the Ukrainians but to Russians as well, constituting thus the mother Church for the Ukrainians, just as it is does for all Russians, Belarusians and other peoples in the broader region. It also maintained that the Metropolis of Kiev was under its supervision, even after the elevation of the Metropolis of Moscow to the status of Patriarchate by the Ecumenical Patriarch Jeremiah II (1589). In fact, in 1620, when the Ukrainian Church had been utterly Latinized and converted with its bishops to Unia,[v] the Ecumenical Patriarchate of Constantinople demonstrated its vivid interest for this church by sending there as Patriarchal representative the Patriarch of Jerusalem Theophanis III, who resurrected the Ukrainian Church ecclesiastically: he ordained Orthodox bishops, restored the eparchial Council of Ukraine, and elected the local Metropolitan with the sanction of the Ecumenical Patriarch. Regarding the 1686 “Act” by which the Metropolis of Kiev passed under the jurisdiction of the Patriarchate of Moscow, the Ecumenical Patriarchate replied to Moscow that this was done for purely political reasons. Even in this way, however, the subjection of the Metropolis of Kiev occurred in “a manner of condescension” and “for reasons of “oikonomia”, as a result of the specific historical circumstances of that period. In other words, this subjection was ‘in trust («επιτροπικώς») until the day comes for divine reckoning’, which means provisional, until the time is right. Furthermore, the fact that there is no full concession of the Metropolis of Kiev to the Moscow Patriarchate is clear for two more reasons. First, the “Act” gives the Patriarch of Moscow only the right to consecrate and not to elect (the election would be made by the Ukrainians) the Metropolitan of Kiev; and second, it is clearly stipulated in the “Act” of 1686 the obligation of every Metropolitan of Kiev to commemorate the Patriarch of Constantinople in the Divine Liturgy. Finally, the Ecumenical Patriarchate maintained that according to its established practice the canonical secession of Patriarchal territory to another is possible only by issuing a special document, known as “Tomos” (“Book”), and not by a simple “Act” or a Synodical “Letter of Issue”, as in the case of the Kiev church. According to the ecclesiastical terminology of that time the term “Letter of Issue” means the granting of permission for the performance of an ordination or another canonical ritual, but was never used to denote the complete incorporation of a canonical territory into another autocephalous Church. Consequently, the Ecumenical Patriarchate never forfeited de jure its canonical rights over the Church of Ukraine, despite the violation of the essence and types of the 1686 “Act” by the Patriarchate of Moscow, and has never denied or abandoned the ‘proper maternal care’ over the Church of Ukraine. Based on the above, it appears that from an ecclesiastical point of view the Ecumenical Patriarchate had (has) the right to intervene in the Ukrainian Orthodox Church, as its jurisdiction upon it is supported both by canonical law and by the Orthodox tradition and practice. 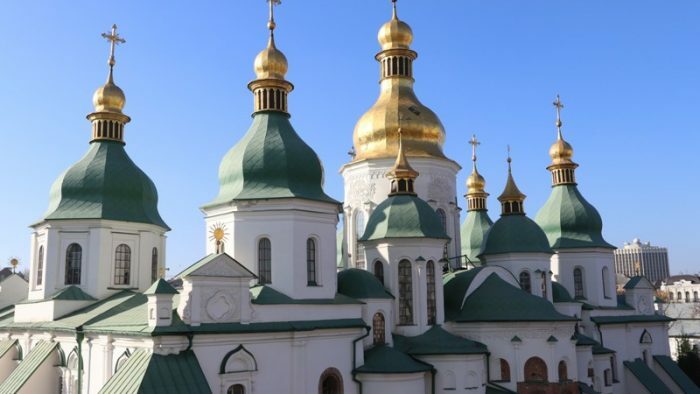 Furthermore, the Ecumenical Patriarchate insists that it has intervened in order to normalize the turbulent ecclesiastical situation in the Ukraine, as the Orthodox Ukrainians remain divided for nearly 27 years (1991-2018). During these years, the Moscow Patriarchate has undoubtedly failed to cure divisions among the faithful, and, under this perspective, Constantinople’s decision may be seen as an act of ecclesiastical responsibility. Why did all this happen? Some argued that had the ROC participated in the Pan-Orthodox Synod convened by the Ecumenical Patriarch Bartholomew in Kolimbari, Crete, Greece (2016), and had not refused to participate, belittling not only the Synod but also the other participating Orthodox Churches, things would have evolved differently, and the matter could have been solved with dialogue. Perhaps…, but the current ecclesiastical crisis between the Moscow Patriarchate and its mother Church, the Ecumenical Patriarchate of Constantinople, is difficult to be understood outside the current international context. In Ukraine, among the Orthodox Christians there are two opposing sides, one oriented towards the Moscow Patriarchate and Russia, and the other towards the Ecumenical Patriarchate and, more broadly, the West. The Ukrainian government, especially after the military annexation of Crimea by Russia, has decided to safeguard its independence from any Russian influence and to pursue an autonomous path. Implementing this decision includes the “autocephaly” of the Ukrainian Orthodox Church, which means that there will be no ecclesiastical authority of a foreign country intervening in the Ukrainian Orthodox ecclesiastical matters. Now the question is whether the Russian side, the Patriarchate and the government, is going to continue using religion as a tool in order to preserve or to expand its influence in the region of the former USSR and further. The recent developments, however, show that the Russian side will not opt to de-escalate the crisis, as it links directly the issue of “autocephaly” with the rights of the Russian-minded people in Ukraine. Furthermore, the Russian government considers that the decisions of Patriarch Bartholomew are imposed on him by the West, particularly the United States. Indeed, the stakes of the Ukrainian ecclesiastical question are very high for the Russian side. This may be understood if viewed under the centuries old policy of the Moscow Patriarchate to emerge as the “Third Rome”,[vii] undermining the Ecumenical Patriarchate of Constantinople. If the Moscow Patriarchate loses its influence in the Ukraine, then this might constitute the end of the Russian dreams[viii] to fully control Orthodoxy. So far, the Ecumenical Patriarchate seems to be managing the Ukrainian crisis differently than the Moscow Patriarchate. The Ecumenical Patriarch Bartholomew insists that the motivation of his actions is exclusively his Christian interest for the divided and spiritually tormented Ukrainian faithful. He considers his decision to grant autocephaly as an act of ministry (diaconate), he strongly rejects any political motivation behind his decision, and, although he considers this crisis as a “temporary storm”, he opposes firmly and unequivocally the expansive aspirations of the Moscow Patriarchate. In fact, he characterized the acts of the Moscow Patriarchate as of “fake authority”, as acts of those who “pretend to be the First without actually being”. As for the ROC, developments show that the decision to unilaterally interrupt the “Eucharistic communion” with the Ecumenical Patriarchate has been disadvantageous for itself rather than for Constantinople. The ROC has rushed into this decision without previously consulting the other Orthodox Churches, and so far has managed to gain support only from its traditional allies, the Serbian Orthodox Church and the Patriarchate of Antioch, whose support came as no surprise given Russia’s ties with the Syrian government. that since 1992 the Russian state and Church, instead of contributing to end the political and religious conflict within Ukraine and particularly among Orthodox Christians, have followed divisive policies, which culminated in the annexation of Crimea and the undermining of the Ecumenical Patriarchate’s prestige and position. the Russian side will follow up on the issue and, at least, the unbecoming attacks already registered, particularly in the web, against the Ecumenical Patriarchate and the person of the Ecumenical Patriarch are expected to continue and increase. Yet, the final and crucial question is how high the crisis is going to escalate, and whether the two Churches are going to reach the point of what the press has already called as the “Schism”. This, in our view, depends primarily on Russia, but also on the willingness of its recent ally Turkey – which often undermines the role of the Ecumenical Patriarchate – to assist Russia in implementing its policies against its “mother Church”. Both these actors, and particularly Orthodox Russia, should however consider that only the Patriarchate of Constantinople – the institution and not any man – carries for more than 15 centuries the moral and religious authority of the “Ecumenical”, and this is a title that no political or other decision may eradicate. [i] Cyril Hovorun, “Civil Religion in the Orthodox Milieu.” In Political Theologies in Orthodox Christianity: Common Challenges and Divergent Positions, edited by Kristina Stoeckl, Ingeborg Gabriel, and Aristotle Papanikolaou, London: Continuum, 2017, p. 259. [ii] In 1990, Filaret was the front-runner to head the ROC, but he was eventually defeated by Patriarch Alexius. [iii] President Poroshenko asked the Ecumenical Patriarchate’ s support in resolving the ecclesiastical issue of Ukraine since July 2016: http://www.romfea.gr/epikairotita-xronika/9595-proedros-oukranias-to-oikoumeniko-patriarxeio-na-stirijei-tin-autokefalia, accessed October 27, 2018 (in Greek). [iv] Constantinople has been under the Ottomans’ rule since 1453. [v] The word “Unia” (from “unio”) was first used in the 15th and the 16th centuries in order to describe the recognition by some Eastern European Orthodox Churches of the Pope’s primacy and their ecclesiastical adherence to the Roman Catholic Church (instead of Constantinople); the term has a negative connotation for the Orthodox churches as it signals the Vatican’s efforts to dominate over Eastern Orthodox Christianity. [vi] In the words of Patriarch Bartholomew: “For this reason, as we have given Autocephaly in all the local Churches, our Holy Synod decided to assign the Autocephaly to the very tortured Ukraine, in order to move within the system of the Orthodoxy in unity and inner peace”. [vii] Constantinople, after the 4th century AD, became the political and religious capital of the empire and was often called the “New Rome”. If the Ecumenical Patriarchate is replaced in the leadership of the Orthodox Churches, then, from a religious perspective, there will be another “new” Rome, the “Third”; obviously, such an outcome will strengthen Moscow’s religious and political prestige. The “Third Rome” as a theological and political ideology was formulated in the early 16th century maintaining that the Russian church and the Russian State are the heirs of the Orthodox legacy and of the Byzantine Empire. [viii] See for the close connection of the two: Nicolai Petro, “The Russian Orthodox Church,” in Routledge Handbook of Russian Foreign Policy, edited Andrei P. Tsygankov, London: Routledge, 2018, p. 217-232. [ix] Ain Riistan, ‘’The Moscow Patriarchate and the conflict in Ukraine’’, In Sojateadlane (Estonian Journal of Military Studies), 2/2016, Vol 6: The crisis in Ukraine and information operations of the Russian Federation, Edited by Vladimir Sazonov, Andres Saumets and Holger Molder, p. 211; https://www.ksk.edu.ee/wp-content/uploads/2016/12/sojateadlane_2_www.pdf, accessed November 03, 2018. [x] Nicolai Petro, “The Russian Orthodox Church,” in Routledge Handbook of Russian Foreign Policy, edited by Andrei P. Tsygankov, London: Routledge, 2018, p. 217-232. Pavlos Serafeim is a postdoctoral researcher at the Institute of “International, Defense and European Analyses”, University of Macedonia, Greece.